Hogwarts letter got lost in the mail? Don't worry: You can still experience Halloween the Harry Potter way by visiting one of these events. 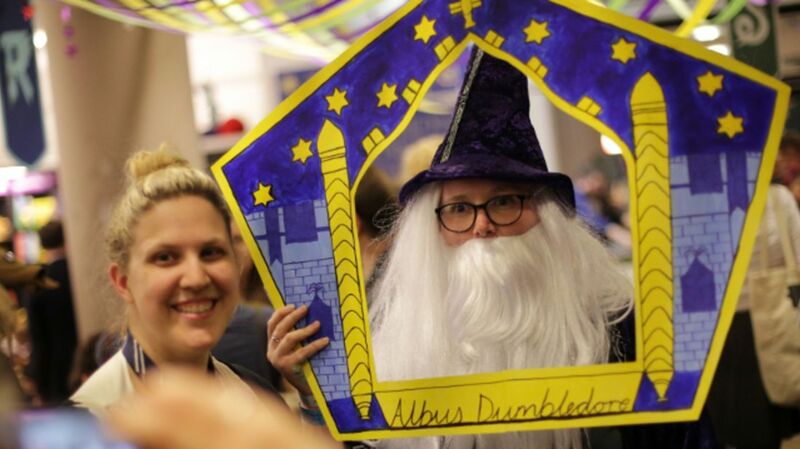 From fast-paced Quidditch tournaments to frothy mugs of butterbeer, these community festivals and private events will help you celebrate the most magical night of the year the way Dumbledore would have wanted you to. Press Bay Alley in Ithaca, New York transfigures into Diagon Alley from October 28 to 30 this year, and you don’t even need to tap any bricks with a wand to get there. In fact, it’s free, so it’s extra easy for muggles to attend. Wizarding Weekend started last year as a one-day trick-or-treat route for the community, but blew up like a game of Exploding Snap and drew nearly 8000 attendees. This Wizarding Weekend will be just as magical as the last, with Quidditch matches (on electric bikes instead of broomsticks), advanced potions (a.k.a. cocktails) classes for adults, Horcrux scavenger hunts, Dark Arts coffee tours, and more. If your permission slip is signed, visit Valley Street in Scottsvilla, Virginia from noon to 10 p.m. on October 29 for a day in Hogsmeade. Local stores transform into their wizarding world alter egos, like Honeydukes and Ollivanders, and host Harry Potter-themed activities. Adults (21 and over) take over the Children’s Discovery Museum on October 21 from 7 p.m. to 10 p.m. Get sorted into your Hogwarts house and take classes like divination, herbology, and potions. Admission is $25, but includes food and a free drink ticket. Come in your finest wizarding attire or dressed as your favorite character from the series. The Ada Street restaurant gives Hogwarts a run for its galleons on October 28 to 30. The restaurant will serve guests a four-course dinner complete with firewhiskey dessert; each course is paired with Harry Potter-themed cocktails, like Pumpkin Juice and the Dementor Antidote. Diners will also enjoy a pre-dinner butterbeer at the Three Broomsticks, as well as house sorting and Quidditch beer pong on the patio. Tickets are $75 and include tax and tip. Hogwarts alums get to dust off their robe uniforms on October 22 at the Omaha Children’s Museum. Activities at this adults-only event include Harry Potter trivia and a costume contest, plus a special “potions class” science show. Appetizers and drinks, including nonalcoholic butterbeer, will be served. The museum’s permanent exhibits will remain open for this event as well. The event is sold out, but you can have your named added to the wait list by calling the museum. This festival, held from October 21 to 22, is more expansive than the underground vaults at Gringotts, spanning a full 10 blocks of Philadelphia's Chestnut Hill neighborhood and drawing in thousands of attendees. Attendees can have a cup of tea at Madame Puddifoot’s, explore the Triwizard straw maze, try hands-on activities at Horcrux stations, see live owls, ride thestrals, and more. There’s also a ticketed Potter Pub Crawl complete with glasses of butterbeer, and a Harry Potter conference with an academic bent, but admission is free to both the festival and the Quidditch tournament. From October 21 to 23, witches and wizards young and old celebrate all things Potter at this pay-as-you-go community festival. (Guests also have the option of paying $25 for the entire weekend.) There are plenty of Hogwarts classes on the roster, like Defense Against the Dark Arts and Potions, as well as house sorting, live raptor demonstrations, wizard roller-skating, and Horcrux hunts. All the activities and events are laid out on the festival’s version of the Marauder’s Map; just solemnly swear you’re up to no good. The Huron County Museum gets Potter-fied on October 29 from 10 a.m. to 6 p.m. with activities like a costumed photo booth and face painting. The museum’s stationary train becomes the Hogwarts Express for the night, and Ministry of Magic officials have volunteered their services for misguided museum tours. Sweet tooths will be satisfied with a Honeydukes candy trolley and (nonalcoholic) butterbeer. Admission is $20 for adults and $10 for kids, with proceeds to support local food banks.